We are all Norwegians today. We should all behave like Norwegians tomorrow. What a horrific tragedy in Norway! 93 76 dead people, mainly teenagers. 96 injured in the twin terror attacks. I’ve been giving some interviews for Portuguese radio, TV, and newspapers since Friday (22/07/2011). You can find a lot of that online (I’ll try to find the links, and I’ll post it below). I refused to say on television, on TVI’s evening news with Judite de Sousa (Friday, 22/07/2011, 8pm in Lisbon), that it was an Islamic terrorist attack, without any official confirmation. I brought the 1995 Oklahoma bombing case to the discussion, and I said that the media are experts in feeding speculation, promoting Islamophobia. I didn’t know who was responsible for the attacks back then. That got me some haters (and some “funny” emails too), because how could I deny an Islamic attack! What a disgrace, a sociologist, a PhD student not confirming the “evidence”. Well, as a good researcher, I wait for data, for facts. It reminded me of Edward Said, author of “Orientalism”, who was completely harassed by the media, when the Oklahoma bombing attack occurred, trying to make him acknowledge an Islamic terrorist attack, without any sort of evidence. It wasn’t an Islamic terrorist attack, it was a twin terrorist attack (yes, it is still terrorism! Terrorism is not a synonym of Islamic terrorism) by a Norwegian Timothy McVeigh, Anders Behring Breivik, 32-years old. A man connected to the extreme right-wing ideology, against multiculturalism, Islam, and “cultural marxism” (you can read his online “manifesto“). A Christian, not a Muslim. He not only destroyed the governmental buildings in Oslo (killing 8 people with the bomb explosion), he also attempted to annihilate the future and the democratic structure of a country. He shot dead 68 people on the island of Utøya, during the Labour party youth camp. Mostly young people; the future of the left-wing party, currently in power. Sad. Sad. Sad. It kind of brings back some reminiscences of the Argentinean “abducting children” during the Dirty war. Prime Minister Jens Stoltenberg’s speech held in Oslo Cathedral July 24, 2011. Oslo Mayor, when asked if we need more security. Of course, this has been the answer in the short-run, we still have to wait for the effects in the long-run. Norwegians are still digesting what happened, and these types of tragedies bring people together. But let’s see how these events affected the Norwegian level of social trust, social tolerance, and sociability. I suspect it is going to be the same or even higher. Again, this is just an hypothesis. I’ll wait for the data. My last radio interview can be found here (6:07 & 15:43). A very interesting piece by journalist Luís Nascimento, which also interviews the vice-president of the Norwegian parliament, a member of the Progress party, and Hanne Marthe Narud, a political scientist of the University of Oslo, among other locals and Portuguese immigrants in Oslo. Join us for a minute of silence today at 12:00 CET. Some of my contributions to the PT media can be found here, here, here, here, here, and here. I still need to find the TV interviews (for TVI & TVI24h) and radio comercial interview. I actually spoke first with radio comercial on Friday, right after the explosion. This is the consequence of having so many journalist friends. 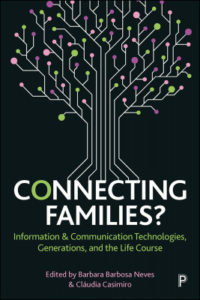 Social capital, again and again. The march was so inspiring. Well, it wasn’t a march because soo many people participated that there was literally no space to walk. 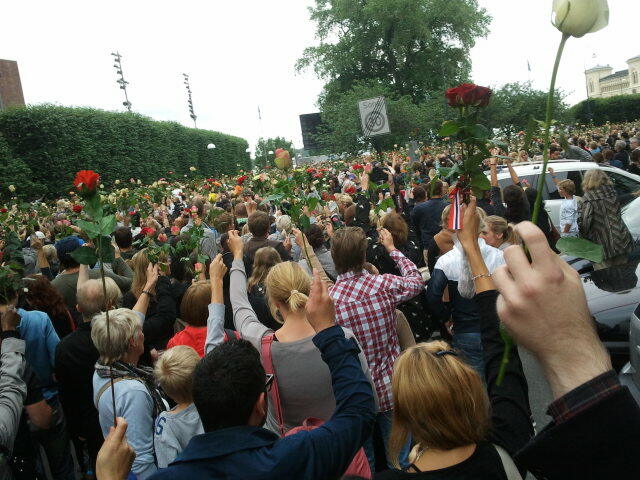 This shows how Norway fights back: 250.000 people in Oslo holding roses and standing together for peace and tolerance. As the Norwegian Crown Prince said “the streets are filled with love tonight”. The messages were, once again, to emphasize the democratic and humanistic values of the Norwegian society: freedom, respect, democracy, and social tolerance. Similar marches all over Norway.